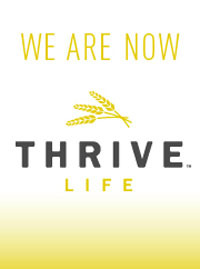 I'm an Independent Consultant for THRIVE Life (formally known as Shelf Reliance) and I LOVE being part of this wonderful company and business opportunity! I love the food and emergency products we offer. I also love helping others eat a little healthier, save time in the kitchen, and save money on their grocery bills. I started this blog to share some of the recipes I make and others from my team to show you how easy it is to use THRIVE! I'm always looking for people to join my team to help others create a thriving life! If YOU love food...then this is the right company for you! Our vision is to help people create thriving lives around the world. Kansas City IgNite Event on May 9th! NEW THRIVE Sauces - Just Add Water! NEW THRIVE Spices and Seasonings!